Here’s a good life tip – the first two jobs you land have the biggest impact on your career. Because that’s where your real development begins, says Evelyn O’Toole, the winner of the WMB Businesswoman Award 2016. She is a scientist, entrepreneur and founder and CEO of Complete Lab Solutions (CLS), a leading provider of sampling, analysis and analysts on contract to the food, environmental, pharmaceutical and medical device industries. “It’s those first two jobs that mould you for the future,” declares the dynamic Co. Galway woman, who set up her own laboratory business in 1994 when the lab in which she was working burned down. Yes, she says, a strong foundation in the sciences can open a lot of doors, but essentially it’s really only a licence to get your first job and enter industry: “When you get in – that’s where it kicks off,” she declares. And she’s living proof of where those first jobs can bring you. After studying biology at Athlone IT, O’Toole landed a job in the Research & Development department of an industrial paints firm in the UK – an unusual trajectory for a budding biologist, one would have thought. In fact for O’Toole, that biology-and-paint mix worked out pretty well. “I had a good foundation in the sciences and was able to transfer my skills to receive training on the job. “I stayed with the paint company for about a year and learned a lot,” she says, adding that she loved the work. However, one of the most important things she learned was that if she wanted to move up the career ladder, she’d need more qualifications. “I wanted to know about water, waste-water, food and the environment,” recalls O’Toole who hails from Cushatrough near Clifden. She returned to Ireland and studied for a Diploma in Pollution Assessment and Control from the Sligo Institute of Technology. “The company made smoked salmon and my job was to test the waters, the product and the surfaces in the plant and generally oversee hygiene management in the plant.” After two and a half years, however, the plant was destroyed by fire and O’Toole was suddenly redundant. Finding herself out of a job, the 25-year-old decided to take control of her own future. Two weeks after the fire, she established her own company, Complete Lab Solutions (CLS), which now employs 110 staff and has branches in Galway City and Ros Muc in Connemara. “In layman’s terms what we do is oversee the safety and quality testing of food, water, medical devices and pharmaceutical products. The company collects samples on site from food retail facilities such as delicatessens and fast food restaurants, and brings them back to the laboratory for analysis. CLS also tests water and waste water, and licence compliance: “Our environmental lab is the largest provider of water and waste water testing in the country,” she says. 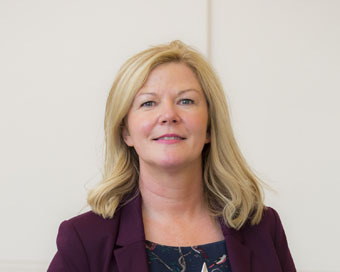 Although she originally established the company to cater for the food industry and water and waste-water sectors, in 2007 she expanded its services and established a laboratory in Galway city, which caters for testing and analysis for the pharmaceutical and medical devices sectors. CLS also supplies this sector with fully-trained, ready-to-go, analysts on contract, the majority of them analytical and microbiological analysts. “For me it’s about aptitude and attitude,” she says. “There are equal opportunities for men and women in the science sector. However, she ponders, the “filter upwards” of females into the higher levels of the corporate world is still disappointingly slow. Fifteen years ago, in 2000, O’Toole attended a programme in Business Development at the Irish Management Institute in IMI in Dublin. “There were 23 Managing Directors and business owners on the course. Two of them were female,” she recalls. “There were 33 CEO and business owners – only two of which were women! We’re still quite a rare breed at the top,” she observes. However, she says, the “feed” of young female scientists is becoming significantly stronger at the bottom of the industry. Females come to CLS generally as analytical chemists or microbiologists. “In my sector at least we have female scientists coming through the ranks,” she says, adding that over the past 18 months the number of applications from female science graduates is higher than ever before – a heartening trend, she believes. This interview was originally published in February 2016 and has been updated to include Evelyn’s WMB Award win.